Long warm sunny days are coming and I can't wait to get in the garden with all my colourful plants and flowers. So while I'm waiting I'll adorn my nails with Spring Flower Nail Art Wraps from Charlies Nail Art. The wraps are essentially water decals. I applied the wraps over a cream base, it's not imperative to have a base colour, but I like to have them in case part of the wrap doesn't completely cover your nail. You need to have some patience with the full wrap water decals, you need to allow them to dry and attach to your nail, so take time to apply them. If you've not tried water decals before, give them a go, simply soak in a little water, remove from the backing paper, apply to your painted nails, trim and seal with top coat - done! The 'Spring Flower Nail Art Wraps' water decals currently cost £0.89 and will cover 10 nails. 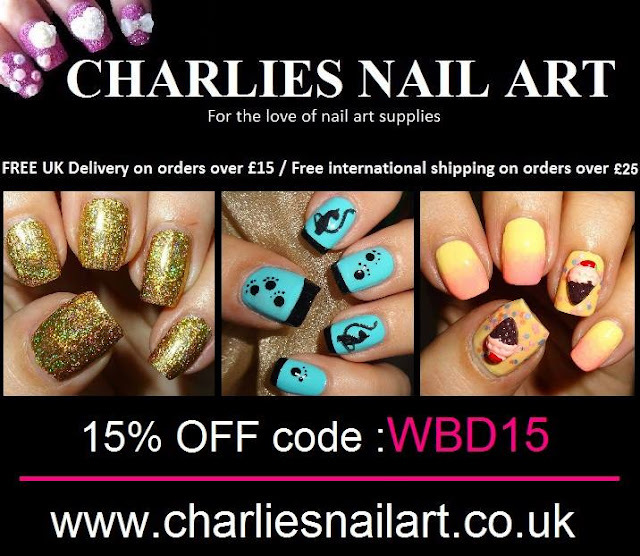 Available at Charlies Nail Art who has a huge range of nail art items.